After placing second in their division at the Fresno Tournament in early March, the boys varsity tennis team is off to a promising start with an overall record of 6-3-0. 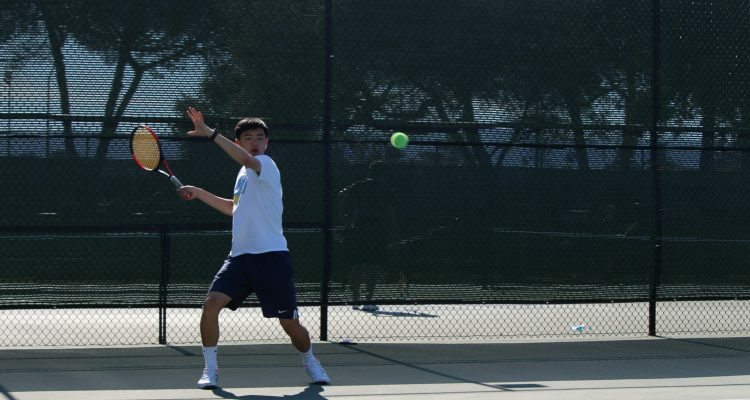 Despite the fact that the team was moved down to the El Camino League following last year’s poor performance, boys tennis was able to win most of their league matches. The team won against Santa Clara High School 7-0, Aragon High School 4-3, Santa Barbara High School 3-3 and Redwood High School 4-2. The only team they have lost to so far is Cupertino High School, which has been their biggest competitor this season thus far. According to junior Samuel Xing, one of the main reasons the team lost against Cupertino was their lack of team chemistry. “We have trouble focusing and closing out the matches where we have leads,” Xing said. Another challenge that the team is facing is poor attendance — not enough players are showing up to games, so there is barely a full lineup. Even players who do show up frequently forget their uniforms, which stops them from playing, according to junior Aaron Li. However, Xing believes the only way to overcome this struggle is to keep practicing every day by doing drills, practice matches and occasionally going to the weight room. Despite a mixed record this season, boys tennis still has over half the season left to improve and prepare for upcoming matches. As the season goes on, Xing is looking forward to playing in the California Coast Section (CCS) playoffs, which will take place from May 1-3. “The teams in our division aren’t nearly as good as the teams we played last year, so we should be able to go far in CCS,” Xing said. Varsity boys tennis will have a packed schedule with several matches per week. The Vikings will be playing Milpitas on March 21, Cupertino on March 26 and Wilcox on March 28.